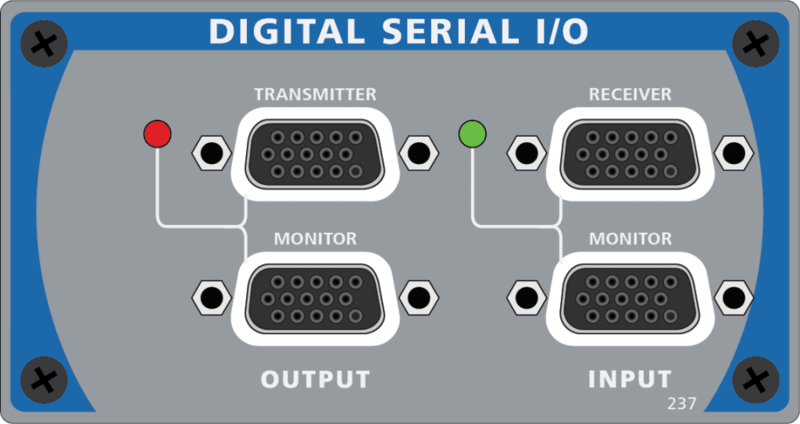 The Digital Serial I/O option adds a multichannel digital serial interface to APx B Series modular audio analyzers. This provides a direct connection to chip level interfaces such as I2S and supports all popular serial interface formats including left justified, right justified, and DSP. In addition the option supports TDM or multiple data line configurations for up to 16 channels of audio data. The digital serial capability is essential in R&D for evaluating designs at the circuit board level. It allows direct connectivity to CODECs, DSPs, analog-to-digital and digital-to-analog converters, sample rate converters, and all types of audio processing and interface chips. Users can access and test board-side inputs and outputs to HDMI (when used in conjunction with the APx HDMI option), SPDIF, and other digital interface transmitters and receivers. Pulse voltage, sample rate, word length, data length and the time relationship between clock and data are variable to accommodate a wide range of devices and applications. The transmitter and receiver are interfaced via HD-15 connectors. 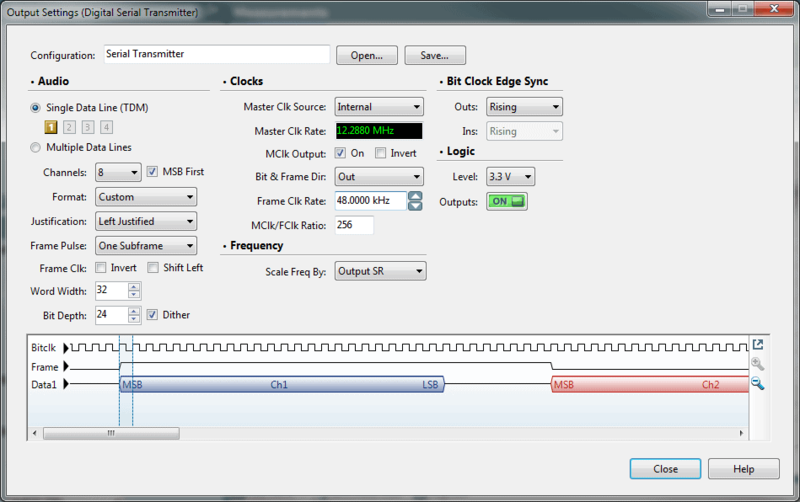 Each connector breaks out to a master, frame, channel, and bit clock in addition to four data lines. Eight channels of audio data can be carried across the four data lines or the system can be configured for TDM (time division multiplexing), allowing up to 16 channels to be carried on a single data line. In addition both the transmitter and receiver signals can be monitored via dedicated, buffered monitor ports. These duplicate the signals at the transmitter or receiver and allow direct monitoring via an external oscilloscope. The APx Digital Serial I/O option includes independent, programmable master clocks for both the transmitter and receiver. This allows the use of two different clocks simultaneously, an important advantage in SRC testing when compared to single-clock serial interface. The Digital Serial option meets the high standard set by APx for ease-of-use. 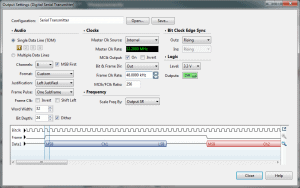 Setup panels include automatic rate calculators and active timing diagrams, and there is built-in support for left justified, right justified, I2S and DSP formats. Presets for testing popular audio devices are also included. Digital Serial configurations can be saved within a project file or saved independently for reuse in multiple projects. All APx500 measurements are available when using the Digital Serial interface. New features have been added for diagnostics, including digital-only generator functions such as Walking Ones, Walking Zeros and Constant Value, and analyzer functions such as Bit Test, which allows APx to verify that the digital output of any device is bit-for-bit accurate. No digital serial interface is easier to use. The Digital Serial option by itself has many applications, but when used in conjunction with the APx HDMI option, truly unique audio test solutions become available. The connectivity between the two options creates a fast and simple solution for HDMI chip developers who need the ability to debug at the circuit board level. It is also the only analyzer in the world that can interface directly to HDMI receiver and transmitter chips, and the only analyzer that can stream high bit rate audio signals such as dts-HD over a multichannel serial interface.